To many, the golden retriever is the perfect companion. Smart, loving and certainly very playful they're great with kids and love to join in with everything. They're good watchdogs, or at least they'll bark when strangers are around, so you probably won't miss the UPS guy, but not particularly great guard dogs as they tend to love people too much to be effective in that role! The fact that they are so playful means that they certainly enjoy - and appreciate - a good dog toy. As a good pet parent, you obviously want to gift them something great, but which are the best toys for golden retrievers? That's just what we're going to take a look at here. This soft, squishy toy is a great way to provide your cuddly critter with a cuddly critter of their own. Moosey KONG is actually only one in a line of ten Cozie critter choices but he is awfully appealing. Moosey is crafted from a fluffy, but fairly durable plush material. He's not quite as 'stuffed' as some soft dog toys, something the manufacturers say is designed so that there is minimal mess to clean up should your fur kid get just a little too excited when playing with him. He also comes in two sizes, small and medium, but we do think that the larger option would be the best choice for a golden retriever. Although golden retrievers love to play they also love to snuggle, and if you can't always be around to snuggle with them, a toy like this one can be comforting for them to have around. According to many of the pet parents that purchased this toy their pups became especially attached to it, even when it had been very 'well-loved' and even, in some cases, relieved of its squeaker and stuffing. Will this golden retriever plush toy last forever? No, no dog toy does, especially in the paws - and jaws - of a playful retriever. Some pet parents reported this one actually barely made it through the day, while others reported it had a longer lifespan but the one thing that came up again and again was just how much the dogs still loved the toy even when it was little more than a fluffy skin. 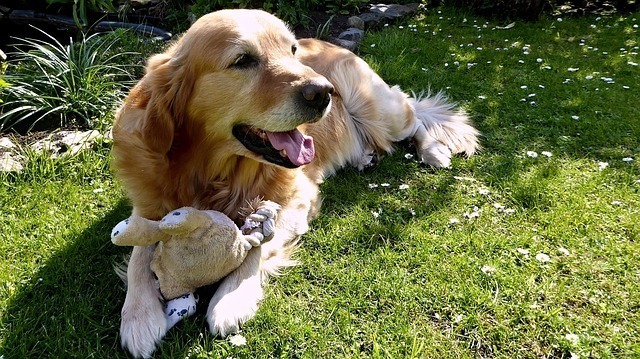 And as it is very reasonably priced replacing the KONG Cozie Marvin the Moose Dog Toy isn't a huge expense which is why we rank it as the best toy for golden retrievers and for puppies too! 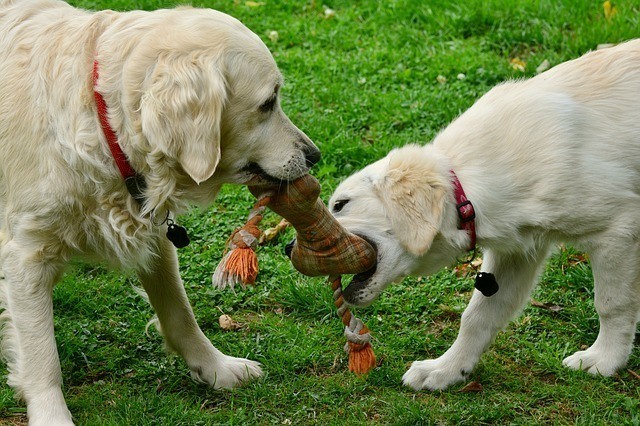 As their name suggests, golden retrievers love to fetch things. With the Wildlife Critter dog toys, they can also go on a 'mini hunt' with you, as the range features ducks, raccoons, chipmunks and more that they should enjoy 'catching'. These are fairly large dog toys, suitable for a bigger dog like a golden retriever, and they feature a nice, loud squeaker that will help keep your pup even more engaged with their new friend. Each creature is brightly colored, nicely crafted and even fairly realistic (especially the duck). Retriever toys like this one make for very good toys for golden retrievers! According to reviews left by pet parents who have purchased one of the Wildlife Critter Dog Toys for their pup while certainly not indestructible these rather charming woodland critters hold up rather well when faced with excited, if rather enthusiastic chewing. The toys also hold their shape well and the squeaker lasts longer too, another big plus. And since the construction matches the standards set for the safety of toys for human (non-fur) children you can be confident that it is safe for your furkids to play with (something that is very important to keep in mind when shopping for any dig toy). Almost every golden retriever enjoys an energetic game of tug at least once in a while, but finding a toy that can stand up to their often very strenuous tugging can be a challenge, but the KONG Wubba Classic Dog Toy fits the bill nicely. This brightly colored tug toy features not just one but two balls covered with a durable nylon. One ball is a tennis ball, great for lots of bouncy action and the other is a squeaky ball that is great for use by keen chewers. Does this toy tick the "good golden retriever toys for chewing" test - absolutely! The toy features tough, long tails, handy for those aggressive games of tug of war that most retrievers love so much. According to a number of pet parent reviews, the KONG Wubba holds up well to even the most aggressive chewing and offers dogs hours of enjoyment both when they are playing with the family and hanging out alone. Some folks are on their fourth or fifth Wubba, simple because their pup literally loves them to 'death' and can't stand to be without it! Sometimes the simplest dog toys can bring a surprising amount of pleasure to both pups and their human parents. The Mammoth Rope Toy is a perfect example of such a toy and rope toys are among the best dog toys for chewers. Those who have purchased the Mammoth Rope Toy were seriously impressed with just how tough it is, reporting that it's able to stand up to even the most aggressive play. many were also impressed with how thick and well made the rope is, especially as a thin flimsy rope is no fun to play with at all! As we mentioned earlier, golden retrievers are some of the smartest dogs around, so a challenge for their brain is something they really enjoy. The Outward Hound Hide A Squirrel Puzzle Dog Toy can provide hours of puzzling fun for both dogs and the humans playing along with them as well as six new 'friends' to choose from when it's time for quiet cuddle time. This squirrel nest dog toy is a fantastic interactive toy for golden retrievers. It truly offers a lot - especially considering its very reasonable pricing - and is cute and fun too. The 'tree' is 'home' to six lovable looking squirrels, each of which can be hidden inside a hole for pups to sniff out one by one. If a treat is hidden in the squirrels' paws the game becomes even more fun and can be played over and over again. Pet parents are, on the whole, very impressed with this clever dog toy. It comes in several different sizes - with the Ginormous being best suited for most golden retrievers - and is surprisingly durable for such a plush looking toy. These squirrel toys are a great way to keep golden retriever puppies amused too, with many of those who have purchased it reporting that it keeps their dogs amused for hours at a time and then they still keep coming back for more! This is another interactive toy that is designed to challenge a pup's brain and it does a great job according to many of the pet parents who have purchased this dog treat ball dispenser toy. This sturdy plastic ball is designed to be filled with tasty treats and then tossed to eager pups for them to figure out just what they need to do to get at them. The puzzle features several different levels of difficulty, so when they have mastered one and can get right to the treats every time you can up the ante to make the game more challenging again. If you're looking for a good toy for your smart dog then this fits the bill nicely. While some dogs lose interest, it seems, because they can't quite figure things out, most have a great time with the ball, both as a way to get themselves a few tasty morsels and simply as a fun toy to chase around. Many of those who have bought the IQ Treat Ball say it's surprisingly durable as well, even when it is used - and sometimes abused - a great deal. Playing a game of fetch with a sturdy ball is one of the simplest - but still yet very satisfying - outdoor games you can play with your golden retriever. The Chuckit! Ultra Rubber Ball Dog makes that simple game even more fun though, as it adds an extra element of fun as it is super bouncy and even floats in water. The ball can be used as a standalone toy or paired with the Chuckit! Ball Launcher for even longer throws and a bigger challenge. The bright colors make it easy to track down and the balls are easy to wash when playtime is over. If, that is, you can get your pup to give it back, as many pet parents report that their dogs love the balls so much that when playtime is over they want to hang on to them to use as chew toys, an activity that most say the Chuckit! Ultra Rubber Ball Dog holds up to surprisingly well. These are just some of the great dog toys that are available out there for golden retrievers to enjoy, there are, of course, many more. Also Read: Best Dog Food for Golden Retrievers – Is it Raw or Commercial Kibble? I am NOT sharing my toys! How to Find The Best Toy? Safety: Check the specs, does the toy meet basic safety standards? You wouldn't give an unsafe toy to your human children so why would you consider giving one to your fur kids? Durability: No dog toy lasts forever and some golden retrievers are simply together on their toys than other dog breeds and even other goldens. However, looking for toys with a reasonably good reputation for durability means that your dog's playtime is safer and your money goes further. Stimulation Value: Golden retrievers love to be challenged and they love to please. Look for toys that offer stimulation and fun, as these kinds of dog toys really do make the best dog toys for golden retrievers 99% of the time.